Difference between revisions of "Opel Insignia B"
'''Opel Insignia. 2016 to date (prod. n/a). 5-door saloon, 5-door estate. F/F, F/A, 1490, 1998 cm³ petrol, 1598, 1956 cm³ diesel (I4 DOHC).''' Even more convincing effort from Opel, building on Insignia A’s strengths. Longer wheelbase (by 92 mm) and wider track, helping Insignia bulk up as it becomes the [[Holden Commodore]] in Australia, though boot curiously smaller than Insignia A’s (down 40 ℓ to 490 ℓ). Optional active damping, with decent ride and comfort; torque vectoring available on top models. Relaxing to drive, and quiet with the smaller wheels; larger, 18-inch numbers gave noticeable road noise. Smallest 1·5 has good power, though larger units gutsier. Lighter by 175 kg, C<sub>d</sub> 0,26. ‘Sweepspear’ line from the front door hinted at [[Buick]]; upper chrome strip helped give Insignia B a premium look. Four-wheel drive for flagships, including Commodore. GM Onstar service standard. Sold as [[Vauxhall]] in UK, with regular saloon dubbed Grand Sport; Sport Tourer name retained for estate on both sides of the Channel. Alter the grille, and the cars would be exported to the US as the [[Buick Regal]], with the Country Tourer renamed the TourX. '''Opel Insignia. 2016 to date (prod. n/a). 5-door saloon, 5-door estate. F/F, F/A, 1490, 1998 cm³ petrol, 1598, 1956 cm³ diesel (I4 DOHC), 3564 cm³ (V6 DOHC).''' Even more convincing effort from Opel, building on Insignia A’s strengths. Longer wheelbase (by 92 mm) and wider track, helping Insignia bulk up as it becomes the [[Holden Commodore]] in Australia, though boot curiously smaller than Insignia A’s (down 40 ℓ to 490 ℓ). Optional active damping, with decent ride and comfort; torque vectoring available on top models. Relaxing to drive, and quiet with the smaller wheels; larger, 18-inch numbers gave noticeable road noise. Smallest 1·5 has good power, though larger units gutsier. Lighter by 175 kg, C<sub>d</sub> 0,26. ‘Sweepspear’ line from the front door hinted at [[Buick]]; upper chrome strip helped give Insignia B a premium look. GM Onstar service standard. Sold as [[Vauxhall]] in UK, with regular saloon dubbed Grand Sport; Sport Tourer name retained for estate on both sides of the Channel. Alter the grille, and the cars would be exported to the US as the [[Buick Regal]], with the Country Tourer renamed the TourX. Four-wheel drive for flagships, including Commodore, where the Country Tourer became the Commodore Tourer. V6 for [[Buick]] and [[Holden]]. Opel Insignia. 2016 to date (prod. n/a). 5-door saloon, 5-door estate. F/F, F/A, 1490, 1998 cm³ petrol, 1598, 1956 cm³ diesel (I4 DOHC), 3564 cm³ (V6 DOHC). 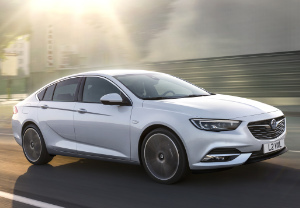 Even more convincing effort from Opel, building on Insignia A’s strengths. Longer wheelbase (by 92 mm) and wider track, helping Insignia bulk up as it becomes the Holden Commodore in Australia, though boot curiously smaller than Insignia A’s (down 40 ℓ to 490 ℓ). Optional active damping, with decent ride and comfort; torque vectoring available on top models. Relaxing to drive, and quiet with the smaller wheels; larger, 18-inch numbers gave noticeable road noise. Smallest 1·5 has good power, though larger units gutsier. Lighter by 175 kg, Cd 0,26. ‘Sweepspear’ line from the front door hinted at Buick; upper chrome strip helped give Insignia B a premium look. GM Onstar service standard. Sold as Vauxhall in UK, with regular saloon dubbed Grand Sport; Sport Tourer name retained for estate on both sides of the Channel. Alter the grille, and the cars would be exported to the US as the Buick Regal, with the Country Tourer renamed the TourX. Four-wheel drive for flagships, including Commodore, where the Country Tourer became the Commodore Tourer. V6 for Buick and Holden.